Enjoy stunning photographs of Minnesota in all seasons. 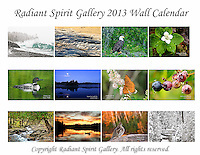 Includes holidays, special events, full/new moon phases, solstices, and full caption descriptions. 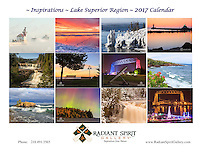 Photographs were created by the award-winning husband and wife photography team of Gary L. Fiedler and Dawn M. LaPointe of Radiant Spirit Gallery. 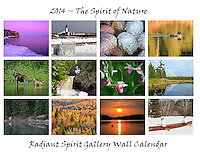 12 month wall calendar measures 17" x 11" when hanging, 11" x 8.5" when folded; spiral bound and printed on heavy, glossy stock. Enjoy "Minnspirations" year-round!